Receive a string from "Ask for Text". Get a file from Finder. Do some codings these inputs in Applescript. Seems like Applescript only receives file as input, I have no idea how to pass string from step 1 to it. Any suggestions are appreciated. note: all "ignore action's input" are uncheck. For my normal usage, typically when using a Set Value of Variable action, the subsequent action will have the [√] Ignore this action's input checkbox checked. This is because one does not typically set a variable and then pass it directly to the next action, unless of course the value of that variable will also be needed elsewhere in the workflow and the next action also makes use of the variable. Since a Ask for Finder Items action in your use case as shown in your question isn't going to use the variable, I've checked the [√] Ignore this action's input checkbox checked, in the Ask for Finder Items action. Of course adjust to your needs. 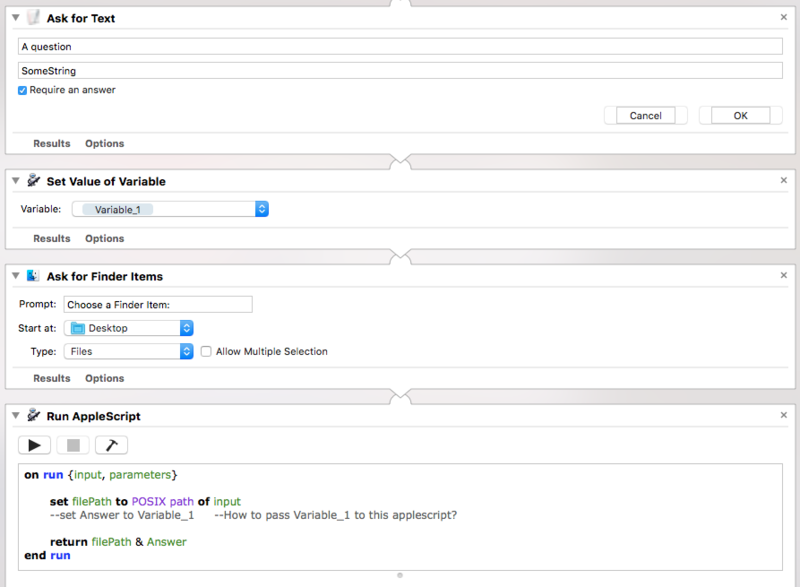 Now to pass both what's returned by the Ask for Finder Items action and the value of the Variable_1 variable, place a Get Value of Variable action between the Ask for Finder Items action and the Run AppleScript action. set Answer to item 2 of input   -- This is the value of the Variable_1 variable. That said, the return line may not be practical as it's just concatenating two strings at that point, so I suspect this is just for testing to see that it actually can return the two pieces of information. How does one Copy, Paste and Tab using Applescript? How to make automator run an applescript that turns of mac?